"The Sound of History: Music tells stories that textbooks ignore" by Dave Elsila, May 2006, Allegro Magazine, publication of Associated Musicians of Greater New York, Local 802, American Federation of Musicians AFL-CIO. "Forgotten: Labor history as opera" by Michael G. Matejka, CD Review, March 2006, Bloomington and Normal Trades and Labor Assembly. Streaming Audio, November 2005: "Radio, Guns and Money" by Steve Jones, sung by Michael Carluccio, Davis Gloff, and Larry Schrock on the Detroit Cast Recording of "Forgotten". Featured song on "Labor Notes Streaming Song Of The Month". "Mysterious murder is not 'Forgotten'" Article by Vivian DeGain, Photos 1 and 2 by Rosh Sillars, September 9, 2005, Special to the Daily Tribune, Royal Oak Daily Tribune. Radio Interview, September 8, 2005: Michigan Morning Edition WUOM 91.7 FM. Audio. 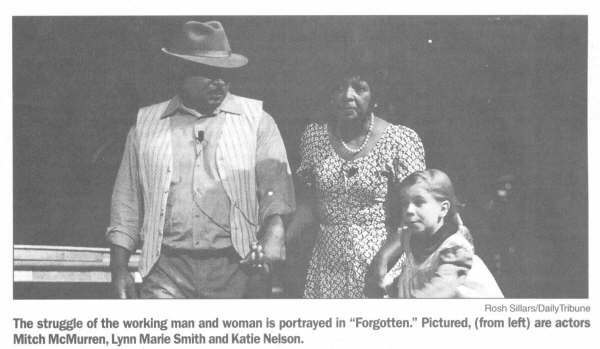 "More than a memory: Jazz/blues opera 'Forgotten' tells story of activist minister in song" by K. Michelle Moran, September 7, 2005 C and G News. "Stepping into gear: A murder, a shipwreck and the postindustrial street realism of garbage - the Detroit theater season begins" by Anita Schmaltz, September 7, 2005 Detroit Metro Times. 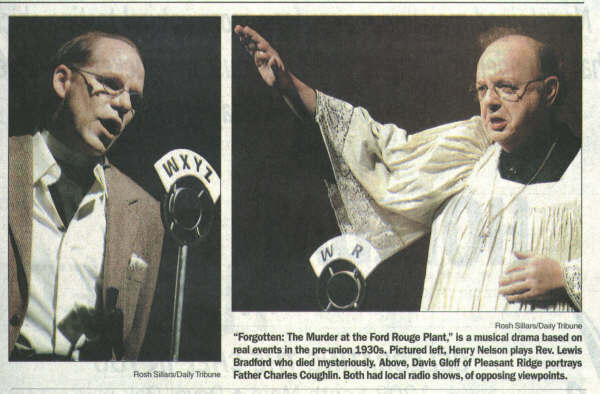 "Local actor in play with labor theme" Friday, September 2, 2005 The Flint Journal. Radio Interview, Monday, September 5, 2005, Labor Day: Shawn Ellis interviewed Steve Jones on WPON 1460 AM. "Labor, religion and a mysterious death: Actors at church to relive debate" by David Crumm, Friday, September 2, 2005 Detroit Free Press. "Workers, Tycoons, and Culture" by Stuart Ferguson, Friday, September 2, 2005, Wall Street Journal, Weekend Journal, W2. Radio Interview, Sunday, August 21, 7-10 pm: W. Kim Heron interviewed Steve Jones and Bill Meyer, music director for "Forgotten" on WDET 101.9 FM. Editorial Review of "Forgotten" by Herb Gunn in The Record, July/August 2005: Forgotten: A Labor of Love. Streaming Audio, March 2005: "We Speak Louder Than Machines" by Steve Jones and sung by Pam Parker on her new album "Imagine". Featured song on "Labor Notes Streaming Song Of The Month". Radio Interview, March 16, 2005, 6:00-6:30 am: WBAI, 99.5 FM, New York City. Mimi Rosenberg interviewed Steve Jones and Elise Bryant about "Forgotten". Michigan Labor History Society Newsletter: Sold-Out Audiences Enjoy 'Forgotten', Summer 2004, by Shawn D. Ellis, editor of the Metro Detroit Labor News, where this review originally appeared. Thur., July 8, 2004, 6-7 pm central time: Heartland Labor Forum KKFI 90.1 FM in Kansas City. Excerpts from the broadcast. Jeff Humfeld interviewed Steve Jones to discuss "Forgotten". More information. Workday Minnesota: New musical drama tells true story of 1930s workplace murder by Barb Kucera, April 18, 2004. Also available at UAW Local 14. National Public Radio's Morning Edition 'Forgotten': A Tale of Unions, Murder at Ford by Bob Edwards, March 5, 2004. Audio.